Algonquin Books released Birmingham native Daniel Wallace’s novel Big Fish in 1998, and it became a runaway success, especially in Alabama, where much of the book is set. Film director Tim Burton read the book, and his film version hit the screen in 2003. Now, some ten years later, Big Fish, the musical, arrives on Broadway. Directed by five-time Tony Award winner Susan Stroman (Contact, The Producers, The Scottsboro Boys), with music and lyrics by Grammy and Tony Award nominee Andrew Lippa (The Wild Party, The Addams Family), and a book by Grammy and BAFTA Award nominee John August (Frankenweenie, Charlie and the Chocolate Factory), BIG FISH began performances on Broadway, Thursday, September 5, 2013, and opened Sunday, October 6, 2013, at the Neil Simon Theatre (250 West 52nd Street). Starring two-time Tony Award® winner Norbert Leo Butz (Dirty Rotten Scoundrels, Catch Me If You Can) as Edward Bloom, Tony Award® nominee Kate Baldwin (Giant, Finian’s Rainbow) as Sandra Bloom, Tony Award® nominee Bobby Steggert (Giant, Ragtime) as Will Bloom, Krystal Joy Brown (Leap Of Faith) as Josephine Bloom, Anthony Pierini (Mary Poppins), and Zachary Unger (Chaplin) alternating as Young Will, Ryan Andes as Karl, Ben Crawford as Don Price, and Tony Award® nominee Brad Oscar as Amos Calloway, BIG FISH features JC Montgomery, Ciara Renée, Kirsten Scott, and Sarrah Strimel, in a cast of twenty-seven that includes Preston Truman Boyd, Bree Branker, Alex Brightman, Joshua Buscher, Robin Campbell, Bryn Dowling, Jason Lee Garrett, Leah Hofmann, Synthia Link, Angie Schworer, Lara Seibert, Tally Sessions, Cary Tedder, and Ashley Yeater. BIG FISH centers on Edward Bloom, a traveling salesman with a huge heart, enormous spirit and an extraordinary vision of the world. Edward's incredible, larger-than-life stories thrill everyone around him─most of all his devoted wife Sandra. But their son Will, about to have a child of his own, must make his way through the smokescreen of his father’s improbably stories to unravel the mystery of who his father truly is. BIG FISH is about dreaming, loving, and living bigger. BIG FISH has scenic design by Drama Desk and Outer Critics Circle Award winner Julian Crouch, costume design by six-time Tony Award winner William Ivey Long, lighting design by two-time Tony Award winner Donald Holder, sound design by Los Angeles Drama Critics Award winner Jon Weston, projection design by Drama Desk Award winner Benjamin Pearcy for 59 Productions, wig and hair design by Paul Huntley, make-up design by Angelina Avallone, musical direction by Mary-Mitchell Campbell, orchestrations by Tony Award winner Larry Hochman, and dance arrangements by Sam Davis. BIG FISH is produced by Dan Jinks, Bruce Cohen, and Stage Entertainment USA with Roy Furman, Edward Walson, James L. Nederlander, Broadway Across America/Rich Entertainment Group, John Domo, and in association with Parrothead Productions, Lucky Fish, Peter May/Jim Fantaci, Harvey Weinstein/Carole L. Haber, Dancing Elephant Productions, CJ E&M, Ted Liebowitz, Ted Hartley, Clay Floren, and Columbia Pictures. BIG FISH is based on the 1998 novel Big Fish: A Novel of Mythic Proportions by Daniel Wallace, and the 2003 critically acclaimed film from Columbia Pictures, written by John August, directed by Tim Burton, and nominated for an Academy Award, Grammy Award, four Golden Globe Awards, and seven BAFTA Awards. BIG FISH had its pre-Broadway world premiere at Chicago’s Oriental Theatre in a critically-lauded 5-week engagement in April 2013. 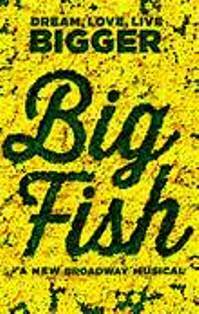 Tickets for BIG FISH range from $49 to $142 and are available at the Neil Simon box office or at Ticketmaster.com (866-870-2717). The playing schedule for BIG FISH is as follows: Tuesday and Thursday at 7 p.m., Wednesday, Friday and Saturday at 8 p.m. with matinees on Wednesday and Saturday at 2 p.m. and Sunday at 3 p.m. A limited number of student rush tickets will be available when the box office opens for that day’s performance. Student rush Tickets are $27 and are only available in person at the Neil Simon box office with a valid student ID. Limit two tickets per person.